Today we have my brother and his other half down to visit! A rare thing, as they are such busy Doctors! So I decided to make a special dessert for tonights meal. 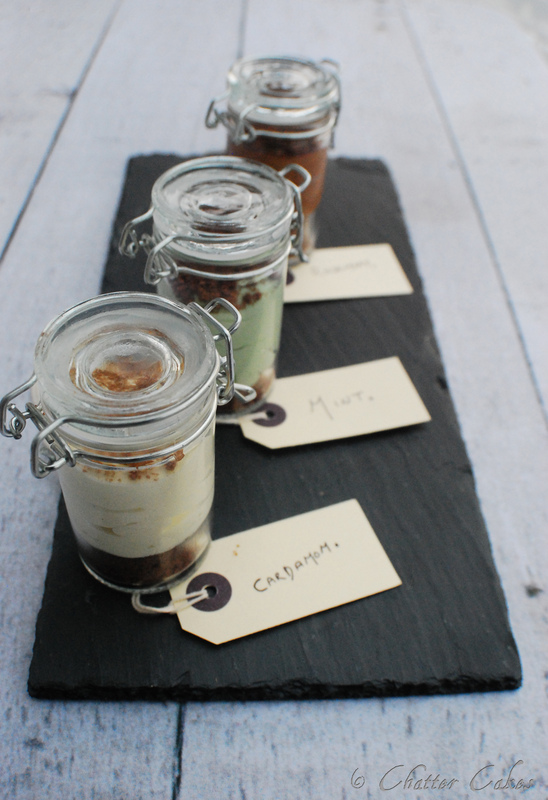 After thinking about what to do for way too long, I settled on making a trio of mousse, served in individual pots! Chocolate and Rosemary, White chocolate and Cardamom and white chocolate and peppermint mousse. The bottom of the jar had crumbled chocolate biscuits, and on top was either chocolate shavings or more biscuit, depending on the flavour. After much debate at the dinner table, the mousse voted favourite was White chocolate and Cardamom! Shame that we have discovered that Mr CC is allergic to cardamom *guilt guilt guilt* but he still enjoyed it hehe. Hope you have all had a wonderful bank holiday weekend/Queens Jubilee, whatever you were doing! Such a pretty picture of the three jars, and what an awesome presentation. Lovely! Thanks Beth 🙂 they are perfect quantities of the mousse…plus I couldn’t resist them, they are so cute!